UK Home Secretary Theresa May has been accused of trying to introduce state censorship of TV broadcasters by a senior Conservative minister in a leaked letter. Former Culture Secretary Sajid Javid wrote to Prime Minister David Cameron in March to express his opposition to May’s proposal to give British broadcast regulator Ofcom new censorship powers. Javid, who was appointed Business Secretary after the election, said the Home Secretary’s plans represented a threat to freedom of speech in the UK. May proposed to give Ofcom the power to vet television shows before they are broadcast, a plan Javid expressed strong opposition to. 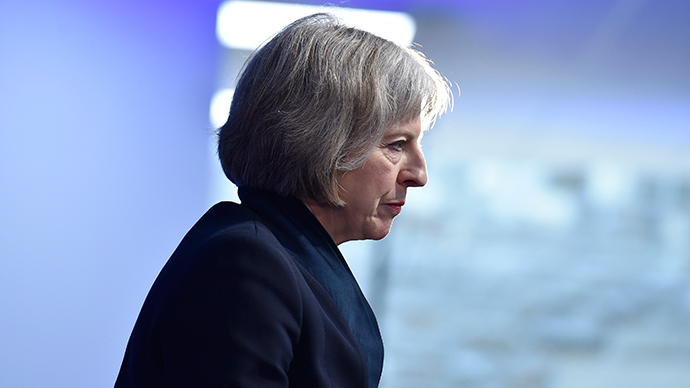 The contentious scheme was part of her extremism strategy ‘A Stronger Britain’, a policy which was prevented from being published before the election due to resistance from other senior Conservative cabinet ministers and the Liberal Democrats. It is unknown whether May’s proposal to screen “pre-transmission” broadcasts made it into the final version of the strategy, the Guardian said on Thursday. However, Downing Street said it will include measures to “strengthen the role of Ofcom to take action against channels which broadcast extremist content” in the Queen’s Speech, Cameron’s opening address to the new Parliament, next week. Javid said the government must balance its responsibility to defend society with its duty to protect freedom of expression. The leaked letter, which was seen by the Guardian, will bolster opposition to government policies critics describe as authoritarian. The new orders were originally blocked by the Liberal Democrats during the Coalition. The Scottish National Party (SNP), now the third-largest party in the Commons, indicated it would block any attempt to resurrect the Draft Communications Bill dubbed the Snoopers’ Charter.